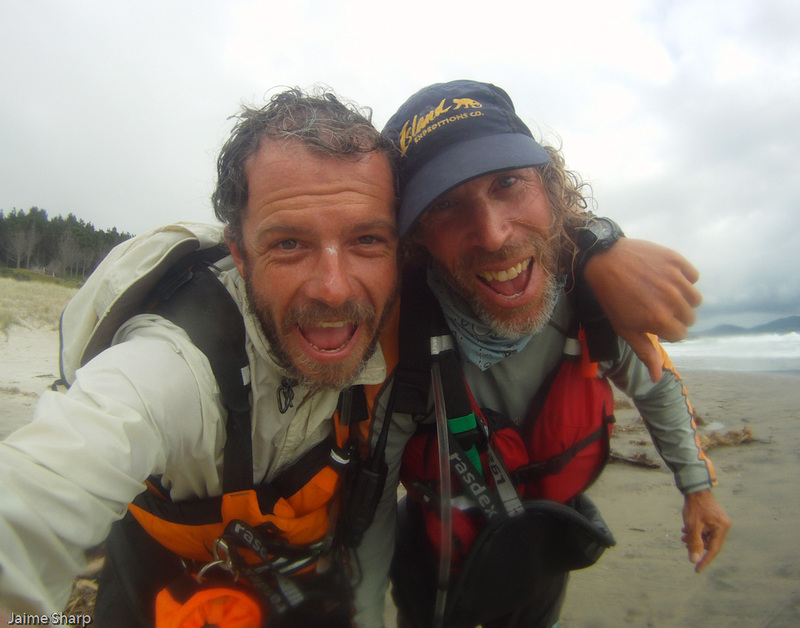 We pulled into Takapuna Boat ramp at 12.30pm after 20 days and 287 nautical miles (517kms) of paddling. With sore muscles, ready to eat lots, repair electronics and boat bits, and have a couple of days off, we loaded our boats atop a car and headed to a friends place. the next two days we will repair ourselves as well as faulty solar charging sytems, a kayak rudder AND ....... FINALLY our Lendal Paddles have been Released by NZ Customs, YAY! Feb 7th, So It Begins! We awoke early both apprehensive of the day coming, this was really going to be the beginning of it! I felt doubts and fears creeping in, but brushed them of as, “just the ideas and fears of failure and the worst case scenario”, in reality, I knew when the best time to go was, the weather was good, and as soon as we got around Cape Reinga, with the weather the way it was, we didn’t have to contend with the surf of the west coast. Dave didn’t know these things as certainty and he wasn’t as cheery as I was, I knew this and I tried to keep him positive, which also helped me keep positive, Dave did not need a beating in a loaded boat, as this would result in a lot more damage to the boat and maybe to him than the day before had provided. The surf break looked great, we were set. We packed the boats close to shore, and by the time we were ready the water had come to meet us, we where however 30 minutes late, the break had changed, it wasn’t as good, but was still doable though we had to go now. We broke out with very little miss hap, though the breaking water was continuous for what seemed like 30 minutes, Dave was feeling a bit defeated he thought we had missed our chance, I assured him to wait, and then like mosses parting the red sea, the surf suddenly opened up. “GO!! F#@#ING GO! THIS IS IT WOOO HOO! Dave and I punched through the first wall of white water, the boats in their loaded state not giving an inch, we then charged for the shoulder of the next one as it curled and broke furiously beside us as it passed, we pushed hard up the last step green face and then slowed down the pace, not stopping yet until we knew we were well out of the rogue wave breaking zone. YES!! IT HAS BEGUN!! I yelped in ecstatic joy! Dave was still a bit charged and speechless, we drank some water and then we where off! Dave was pumped and ready to take on the world, and so was I. what a way to start the trip, some real good lessons, and some great achievements. We packed our surf training into one day and it paid off great. The paddling was stunning, we moved along well off shore, both of us happy to be away from the surf zone for now. The sun beat down and the sky was blue. Rounding the first cape; Marie Van Damon, Cape Reinga came into site, and the swell drop off. Cruising by golden beaches and tall cliffs, we approached the fabled Cape Reinga and its notorious shoal and rip tides, edging in it looked tempting to go on the inside of the shoal as we had got to it on about slack tide and no currents where present . Heading advice however we gave the shoal and its gigantic clapitos waves a wide berth paddling out about 3km’s. I felt very sea sick out here due to all messy large swells mixing, though that was soon forgotten when we looked across the angry waves at the light house of cape Reinga with all its tourist looking out at us ( or at least so we would like to think), and I was stoked. We had beaten the west coast break, we had done the rounding of cape Reinga the trip was now a reality! We punched over 20 knm’s that day; we caught a fresh fish for dinner, and reveled in the change of beach energy compared to the west coast. We came to a beautiful large crescent beach, where we rode in through the small surf, and set up camp behind the dunes. Hot smoked Kawhai (the fish we caught), was on the menu for dinner and we enjoyed the sun setting behind cape Reinga as we talked and reflected on the day and our hopes for the next three months of our trip together. As night fell the light house light blinked away and we retired to the tent triumphant and well feed.